All organic body moisturizer formulated for tattooed skin. Radiates body art and helps skin to maintain it’s luster by alleviating dryness. Use it daily on healed skin. TATTOO BOOSTER is fast absorbing and does not leave an oily residue. Formulated with certified 100% organic Argan oil – rich in antioxidants and full of essential fatty acids-; Vitamin E – helps to fight premature aging and free radicals; Awara pulp oil – one of the best natural sources of vitamin A ( natural sunscreen), sourced from the Amazon basin. TATTOO BOOSTER is the recommended choice for daily use on tattooed skin. Animal cruelty-free, pure, organic skin care. Premium grade, best on the market, cold pressed. Never diluted or chemicals added. A couple of drops is all that is needed for radiant skin. All skin types, not recommended for ultra-sensitive skin. External use only. Can be used in conjunction with a sunscreen protector (SPF 30-50). 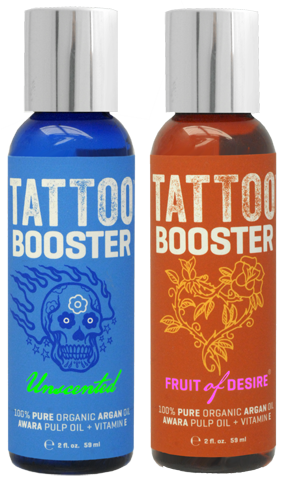 TATTOO BOOSTER is available in an Unscented formula or with our signature Fruit of Desire scent. Easy to use: shake bottle, warm a few drops in the palm of your hand and apply sparingly. TATTOO BOOSTER is NOT a chemical after-care product. It is a certified ORGANIC moisturizer for daily maintenance for your tattoos.Enhances tattoos by keeping your skin radiant and smooth, does not influence ink. Introduced to the USA, Brazil, Switzerland, Japan, Australia and the Caribbean.